Blessed be the holy Trinity and undivided Unity;  We will give glory to Him, because He hath shown His mercy to us. V. O Lord our Lord, how wonderful is Thy Name in all the earth! R. O the depth of the riches of the wisdom and of the knowledge of God! Lord, have mercy. Lord, have mercy. Christ, have mercy. Christ, have mercy. Lord, have mercy. Lord, have mercy. Blessed Trinity, hear us. Adorable Unity, graciously hear us. Be  merciful,  Spare us, O Holy Trinity. Be  merciful,  Graciously hear us, O Holy Trinity. From all evil,  Deliver us, O Holy Trinity. From all sin,  Deliver us, O Holy Trinity. From all pride, etc. From all love of riches,  From all uncleanness,  From all sloth,  From all inordinate affection,  From all envy and malice,  From all anger and impatience,  From every thought, word, and deed contrary to Thy holy law,  From Thine everlasting malediction,  Through Thine almighty power,  Through Thy plenteous loving kindness,  Through the exceeding treasure of Thy goodness and love,  Through the depths of Thy wisdom and knowledge,  Through all Thy unspeakable perfections,  We sinners  Beseech Thee, hear us. O Blessed Trinity,  We beseech Thee, deliver us. 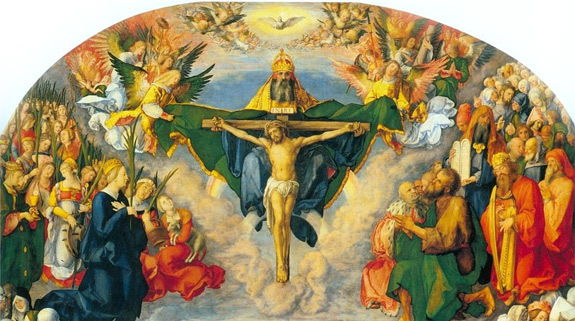 O Blessed Trinity,  We beseech Thee, save us. O Blessed Trinity,  Have mercy on us. Lord, have mercy,  Christ, have mercy. Lord, have mercy. V. Blessed art Thou, O Lord, in the firmament of Heaven,  R. And worthy to be praised, and glorious, and highly exalted forever. Let Us Pray. Almighty and everlasting God, Who hast granted Thy servants in the confession of the True Faith, to acknowledge the glory of an Eternal Trinity, and in the power of Thy majesty to adore a Unity: we beseech Thee that by the strength of this faith we may be defended from all adversity. Through Jesus Christ Our Lord. R. Amen. Most Holy Trinity, Godhead indivisible, Father, Son, and Holy Spirit, our first beginning and our last end, You have made us after Your own image and likeness. Grant that all the thoughts of my mind, all the words of my mouth, all the affections of my heart, and all my actions be always conformed to Your holy Will. After having seen You here below in Your manifestations and by faith, may I come at last to see You face to face in the perfect possession of You forever in heaven. Amen. Prayer: Almighty and Everlasting God, by the profession of the true faith, You have given us, Your servants, grace to acknowledge the glory of the Eternal Trinity, and in the power of Your Divine Majesty to worship the Unity. We beg You to grant that, by our fidelity in this same faith, we may always be defended from all dangers. Through Christ our Lord. Amen. + In the name of the Father,  and of the Son,  and of the Holy Spirit. Amen. V. Lord, open my lips. R. And my mouth will proclaim your praise. V. God, come to my assistance. R. Lord, make haste to help me. V. Glory to the Father, and to the Son, and to the Holy Spirit, R. As it was in the beginning, is now and will be forever. Amen. The decade below is recited three times, once for each member of the Trinity. All: Holy God, Holy Mighty One, Holy Immortal One, have mercy upon us. Our Father who art in heaven, hallowed be thy name. Thy kingdom come. Thy will be done on earth, as it is in heaven. Give us this day our daily bread, and forgive us our trespasses, as we forgive those who trespass against us, and lead us not into temptation, but deliver us from evil. The following is repeated nine times:      V. O Blessed Trinity, to you be praise, and glory, and thanksgiving, for ever and ever! R. Holy, holy, holy Lord, God of hosts. Heaven and earth are filled with your glory. After the ninth time is said: V. Glory to the Father, and to the Son, and to the Holy Spirit, R. As it was in the beginning, is now and will be forever. Amen. After the three decades: With all our heart and voice we acknowledge you,  we praise you, and we bless you, O God the Unbegotten Father,  the Only-begotten Son,  and Holy Spirit, the Comforter;  one,  holy and undivided Trinity. Glory to you forever. V. Let us bless the Father, and the Son with the Holy Spirit. R. Let us praise and exalt him above all forever. Let us pray God our Father,  who by sending into the world the Word of truth and the Spirit of sanctification made known to the human race your wondrous mystery, grant us, we pray,  that in professing the true faith, we may acknowledge the Trinity of eternal glory and adore your Unity, powerful in majesty. Through our Lord Jesus Christ, your Son, who lives and reigns with you in the unity of the Holy Spirit, one God, for ever and ever. R.  Amen All: O Blessed Trinity, free us, save us, and enliven us. + May God the Father,  who has granted us salvation in Christ, his Son,  and in the Holy Spirit, and has given joy to the whole world, shower  us with his graces and his love. R. Amen.